The #TakeBackOhio Labor 2018 campaign is well underway and we are conducting our second Day of Action this Saturday to elect candidates like Rich Cordray for Governor, Sherrod Brown for US Senate and pro-union candidates up and down the ticket. 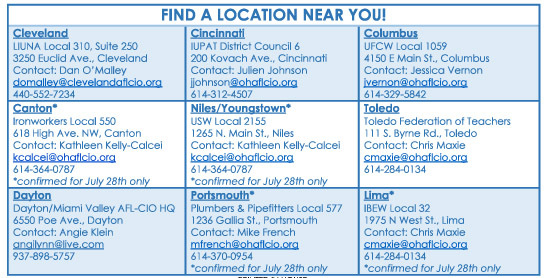 Below are addresses and times for the nine locations we will be running our Labor-To-Labor walks and phone banks. Ohio AFL-CIO President will be kicking off the Columbus canvass, OAPSE Executive Director and Labor 2018 Chairperson Joe Rugola will lead the way in Toledo, 7th Congressional candidate Ken Harbaugh will thank members in Canton, and all across the state labor leaders and Ohio AFL-CIO endorsed candidates will join hundreds of members as we walk and talk to #TakeBackOhio. Thank you for your efforts this Saturday and through Election Day, November 6, to help ensure we elect candidates all across Ohio that will fight to raise wages, create good-paying jobs, fix our crumbling infrastructure, and stand up for our right to organize and bargain collectively. Let’s unite this year and do everything we can to #TakeBackOhio for ourselves and all working people across our great state.